Blues boss Simon Garner is satisfied with the club’s rebuilding process, having made notable improvements on last term. Clitheroe culminated the campaign in 13th spot having accumulated 52 points – four places and nine points better than the previous season. Add to that a Lancashire FA Challenge Trophy Final appearance at the Macron Stadium, home of Championship side Bolton Wanderers, and there is certainly cause for content. “Looking back I think it’s been a decent season, but I always want to do better,” Garner said. “I think every manager is the same. “Reaching a cup final was obviously a big bonus, and over the season we’ve had more highs than lows. “A mid-table finish is good. I’ve got to look at it realistically because I would’ve been happy to take that before the season started. 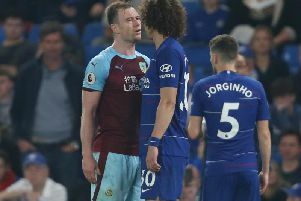 While Garner is still finding his feet in an arduous player-manager role, the 32-year-old midfielder has aspirations of turning the Blues into much more than a mid-table outfit. Having beaten champions Salford City this term, adding victories against runners up Darlington 1883 and Northwich Victoria, while also beating third place Bamber Bridge in the county cup, Garner is striving to bring success to Shawbridge. “I’m still really young in age and experience so I’ve still got lots to learn,” he said. “I’m finding that out as I go along. I came in to the job a bit naive, thinking it would be easier than it was. “After 18 months I’ve realised how tough it is. “I want to improve and make some key additions to the squad. “I always want to improve and better myself because I’m not in it to just try and stay in the division. I aspire to reach as high a position as possible. “I would love to reach the play-offs. It’s a big ask but I’ll give it a good go. You’ve got to have ambition. “There’s some big clubs at this level, it’s a massive challenge. “I’m not saying it’s going to happen just yet but that’s what we’ll be striving towards. • Clitheroe secured a coup on Tuesday when they landed former fans’ favourite Gregg Anderson, after a decade away, following his departure from Conference North North Ferriby United. Garner said: “I am delighted to have secured Gregg for the upcoming season.